When running Microsoft Office Outlook, such as Outlook 2013, Outlook 2016 or newer versions, a first run wizard will open to allow user to setup an email account in Outlook, with messages such as “Welcome to Outlook 2016”, “Microsoft Outlook 2010 Startup” and etc. Regardless of whether you manage to add an email account successfully or skip adding an email account, a profile named ‘Outlook’ is automatically created once Outlook is opened, and the first run wizard will no longer be offered. Profiles store information about mail accounts, calendar, contacts, notes, tasks, reminders, and more, plus the data files in Outlook. Once a profile created, you cannot reuse the profile name, even though you’ve deleted and removed the profile, e.g. default profile ‘Outlook’ from the Control Panel’s Mail settings. 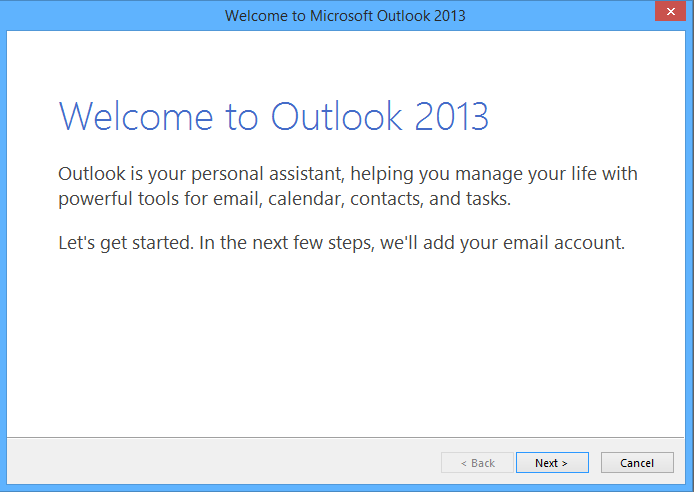 Even though it’s possible to create a new profile to start anew, but in some cases you may want to reset the Outlook to first run or out-of-the-box factory default status in order to start from fresh and clean state again, with no profile created, as if running Outlook for the first time after installation. Use the following trick to reset Outlook so that the default ‘Outlook’ profile is deleted and first run wizard is offered again to set up a new default ‘Outlook’ profile. Exit Outlook completely (make sure outlook.exe is not running in Task Manager). Open Command Prompt as Administrator from user account who is using the Outlook. For other newer version of Outlook, just change the version number, i.e. 15.0, 16.0, to new version accordingly. In addition, the default profile name, Outlook, may not be the same across all versions of Outlook, so it’s recommended to browse the registry key to confirm the name of the profile used. The commands delete the default profile called Outlook located in HKCU\Software\Microsoft\Office\15.0\Outlook\Profiles registry key, and then recreate it with no settings. Run Outlook again, it should open the first run wizard. If you’re using Outlook 2010 or older versions, you can also try outlook /firstrun command to force first run wizard to appear, though it doesn’t actually remove all existing profiles. Note that if you’re not completing the first run wizard to add an email account after reset, Outlook may prompt for profile name, either by selecting an existing profile or create a new profile on next startup when it has an empty profile.